A few weeks back the same-day grocery delivery service Instacart began shuttling Whole Foods goods to select areas of Los Angeles including West L.A., Mid-Wilshire, Beverly Grove, and West Hollywood. Today the company—which claims to deliver most items within one hour of ordering—is expanding its local service to the neighborhoods of downtown L.A. and Culver City. The bigger news, however, is what they’re delivering: In addition to fancy organic foodstuffs from Whole Foods, Instacart is now offering grocery items from CostCo. and Ralphs Markets to some areas. Yes you can now have a gallon drum of mayonnaise, a 70-pack of frosted Pop Tarts, and a enough Goldfish crackers to fuel the entire city’s kindergarten population delivered to your door within one hour, regardless of whether or not you have a CostCo. membership. How the heck does it work? The company employs a crew of “personal shoppers” who, when an order comes in, run inside, buy your stuff, and drive it to wherever you are within two hours for a for a fee of $3.99. Or for $99 users can can subscribe to an Amazon Prime-like service called Instacart Express that waves delivery fees for one year on orders over $35. Grocery prices are set by Instacart, not by the stores, so you may end up paying a bit more for some items, and its up to the consumer to pay attention. Instacart runs similar operations in other cities nationwide including San Francisco, New York, and Washington D.C. Their entry into the L.A. marketplace comes on the heels of Amazon Fresh, which last year began delivering groceries to the L.A. area for a $299 annual fee. 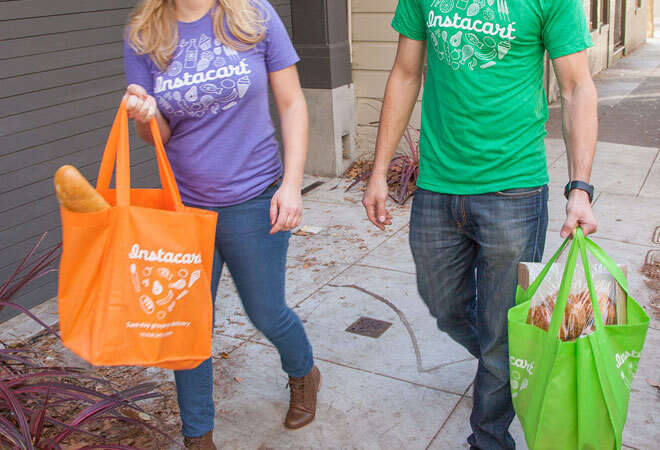 Aside from the $200 price difference, Instacart touts a few other benefits over Amazon. If Instacart’s online database doesn’t show a particular item you know a store carries, just submit a request and the shoppers can grab it for you anyway. Also, your order is not limited to one store, meaning you can have a few items from Whole Foods, Ralphs, and Costco arrive in a single delivery. (It’s an additional fee, but most of us would gladly pay to avoid the parking lots at all three grocery outlets). ✱ EXCLUSIVE OFFER: We plan to give the service a test run in the coming weeks, but in the meantime the folks at Instacart are offering Los Angeles magazine readers free delivery and a $10 credit for their first order! Just type in “lamag2014” at checkout.